Despite sharing a surname with the infamous Tom Wilson, Garret Wilson (no relation) has been named the new captain of the WBS Pens. Restated Tom Kostopoulos, Penguins captain eternal, has retired and someone needs to pick up the matrix of leadership. Realistically the only other player in the running for this honor was J.S. Dea, who in case you missed it, has been claimed by the Devils via waivers. This is Wilson’s third year with the Pens, and there was an outside chance he would have stuck with Pittsburgh this season. 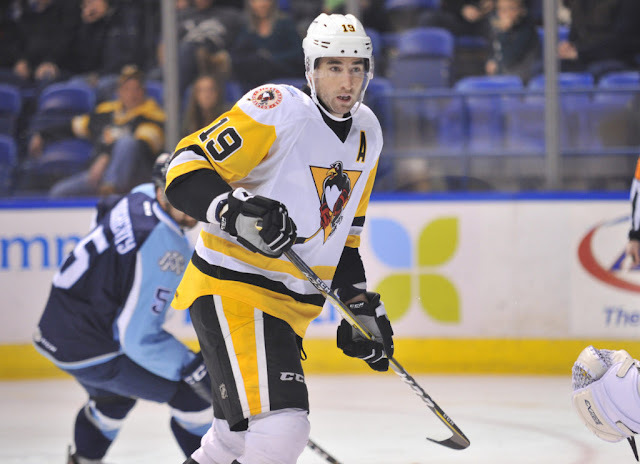 Last season, Wilson was one of WBS’s best forwards scoring 17 times and putting up 25 assists. Hopefully for Wilson, earning the C in WBS is an honor for him and not a mark of AHL-lifer status. Wilson has 34 NHL games under his belt with the Panthers, and 0 with the Penguins. Wilson is now the 17th captain in Team history. The historic 20th season of WBS hockey starts on October 6th. Buckle up.